Denzel Washington is an American actor, director, and producer. Denzel Washington's directorial debut was for the movie Antwone Fisher. His full name is Denzel Hayes Washington, Jr. In 2010 Denzel Washington won a Tony Award for Best Actor for the play Fences. It was later made into a movie and Denzel resumed his role on screen. He was born on December 28, 1954 in Mount Vernon, New York. Denzel Washington was nominated for an Oscar again in 2010 for his role in the movie Flight. He took 10% of his regular salary to play in this movie because of the budget constraints. His father, Denzel Washington, Sr. was a Pentecostal minister and his mother Lennis (Lowe) was a beautician. Denzel Washington met his wife Pauletta Pearson on the set of his first film Wilma. They married in 1983 and have had four children together including John David, Katia, Olivia and Malcolm (twins). Denzel Washington has an older sister named Lorice and a younger brother named David. At one time Denzel Washington considered becoming a preacher. He eventually played the role of a preacher in the film The Preacher's Wife. After graduating from high school, Denzel enrolled at Fordham University, intent on a career in journalism. Denzel Washington first appeared on stage at the age of seven in a Boys & Girls Club talent show. He later became a spokesperson for the organization's awareness campaigns. B.A. in Drama and Journalism in 1977, Washington headed off to San Francisco to take advantage of a scholarship to the American Conservatory Theater. He stayed there only one year before returning to New York to begin a professional acting career. 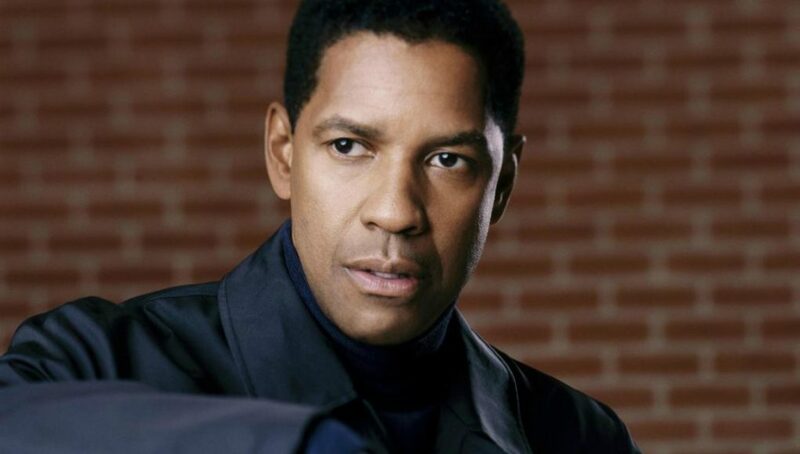 Some of the most famous films Denzel Washington has appeared in include Glory, Malcolm X, The Pelican Brief, Philadelphia, Crimson Tide, Courage Under Fire, John Q, American Gangster, The Book of Eli, Safe House, Flight, and The Equalizer. Denzel Washington has said that his favorite role was Detective Alonzo Harris in the movie Training Day, for which he won an Academy Award for Best Actor. His first paid acting role was in a summer stock theater stage production in St. Mary’s City, Maryland. The play was “Wings of the Morning”, which is about the founding of the colony of Maryland (now the state of Maryland) and the early days of the Maryland colonial assembly (a legislative body). He made his feature big screen appearance in the comedy A Carbon Copy (1981). A major career break came when Washington starred as Dr. Phillip Chandler in NBC’s television hospital drama St. Elsewhere, which ran from 1982 to 1988. Denzel Washington trained for almost a year to play the role of Hurricane Carter, a boxer who was convicted of a triple murder. Story (1984), Hard Lessons (1986) and Power (1986). In 1987, he starred as South African anti-apartheid political activist Steven Biko in Richard Attenborough’s Cry Freedom, for which he received a nomination for the Academy Award for Best Supporting Actor. In 1989, Washington won the Oscar for Best Supporting Actor for his portrayal of Tripp, the runaway slave in Edward Zwick’s powerful historical masterpiece Glory (1989). Denzel Washington had to gain weight for his role in the film Philadelphia in which he played a lawyer for a man with AIDS (Tom Hanks). During the 1990s, Washington established himself on Hollywood’s A-list as an actor who could shine in serious dramas as well as blockbuster thrillers. received an Academy award nomination for his portrayal of the Muslim African-American human rights activist. Denzel was nominated for an Oscar for his role as Malcolm X.
Hollywood movies to deal with issues like homosexuality, AIDS, and homophobia. Crimson Tide (1995) and Courage Under Fire (1996). In 1998, Washington starred in Spike Lee’s film He Got Game. In 1999, Washington starred in The Hurricane, a film about boxer Rubin ‘Hurricane’ Carter, whose conviction for triple murder was overturned after he spent almost 20 years in prison. Washington receive a Golden Globe Award in 2000 and a Silver Bear Award at the Berlin International Film Festival for the role. Denzel Washington performs on stage as well as on film and also directs and produces. Denzel Washington is the first African American actor to win two Oscars, including Best Supporting Actor for the film Glory, and Best Actor in Training Day. In Training Day (2001), Washington played a corrupt and violent police detective, the performance for which he became only the second African American actor (the first was Sidney Poitier) to win an Oscar for best actor. Denzel won his first Oscar in 1989. Manchurian Candidate (2004), Déjà Vu (2006) and Inside Man (2006). Washington also starred as Frank Lucas, a real-life heroin kingpin from Harlem,and in the 2007 film American Gangster, opposite Russell Crowe. In 2007 he also directed and starred in the drama The Great Debaters with Forest Whitaker. Taking of Pelham 123 (2009). In 2010 Washington starred in the postapocalyptic action drama The Book of Eli and collaborated again with Scott on the action thriller Unstoppable. Denzel was nominated for an Oscar for his role as Steven Biko in the 1987 film Cry Freedom. In 2013, Washington starred in 2 Guns (2013), alongside Mark Walberg. After playing a mysterious vigilante in the action thriller The Equalizer (2014), Washington starred in The Magnificent Seven (2016), a remake of the 1960 classic western. In 2016, Washington directed the film Fences, co-starring Viola Davis and based on Wilson’s play of the same name, with a script by Wilson. For his performance, Washington was nominated in the Best Actor category for a Golden Globe Award and an Academy Award. Washington won the 2010 Tony Award for Best Actor in a Play for “Fences”. In 2016, he was selected as the recipient for the Cecil B. DeMille Lifetime Achievement Award at the 73rd Golden Globe Awards. Denzel Washington married actress Pauletta Pearson in 1983; they have four children : John David (born 1984), Katia (born 1986), and twins Olivia and Malcolm (born 1991). Denzel Washington has an estimated net worth of $190 million. The first on screen role Denzel Washington played was in the film Wilma. Washington is a devout Christian, and has considered becoming a preacher. He has been a big fan of the Dallas Cowboys and Los Angeles Lakers since childhood. Almost every summer he and his family go to Italy on vacation. He is the first African-American actor to receive two Academy Awards. Washington became only the sixth actor to win both leading and supporting acting Oscars. The other five are Robert De Niro, Gene Hackman, Kevin Spacey, Jack Lemmon and Jack Nicholson. He has two films on the American Film Institute’s 100 Most Inspiring Movies of All Time. They are: Glory (1989) at #31 and Philadelphia (1993) at #20. Denzel is a huge fan of the television series Monk (2002). He requested Ted Levine to play a role in American Gangster (2007) because he was a fan of the series. He also worked with Tony Shalhoub in The Siege (1998). work with is Martin Scorsese. The offer he regrets turning down the most is Brad Pitt’s role in Se7en (1995). Denzel credits surviving his upbringing and going in the right direction to his schooling choices as many of his earlier friends got into trouble with the law. action film The Book of Eli (2010). Denzel's father was a Pentecostal minister and his mother owned a beauty parlor.